So the story goes, Steve Carb, President of SERG Restaurant Group had the inspiration for Poseidon while vacationing with friends in Costa Rica. 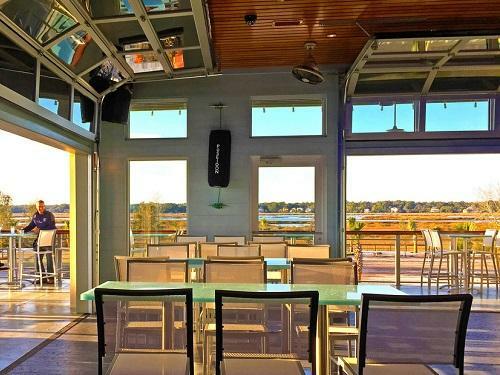 His concept for this new restaurant on Hilton Head Island came to fruition in Shelter Cove Towne Center in December 2014. Carb was shooting for a once-in-a-lifetime location overlooking the waters of Broad Creek with a spectacular sunset view. “Coast-to-Coast” culinary and lifestyle experience was the mantra, and they pretty much nailed it. From the covered outside front porch dining and NautiBar, to the “World is Your Oyster” Bar and Main Dining area inside, to the Rooftop Bar, you have plenty of options. With Shelter Cove shopping and the adjacent Community Park with Sunset Celebrations, you can make a day AND night of your visit. It’s no surprise Poseidon was voted Hilton Head Monthly’s 2015 Reader’s Choice awards for Favorite New Restaurant and Favorite Bar/Late Night Establishment. With so many delicious options on the menu, it’s hard to choose what to order. Check out the daily fresh fish and seafood as well as selections on the Oyster Board. 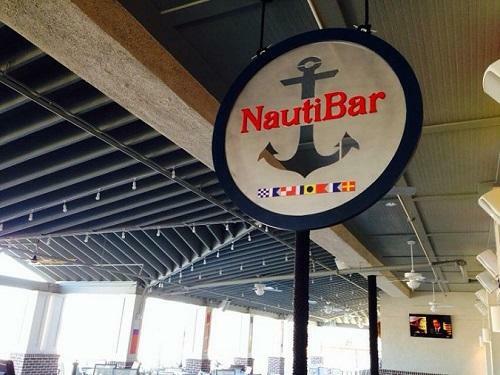 I’m partial to the Oyster Bar or NautiBar at happy hour. Plenty of beer on tap, and specialty drinks including the Montauk Mule served in a Signature Copper Mug. 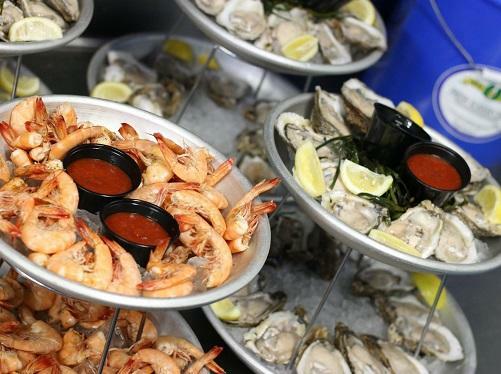 The oysters, shrimp and crab claws on display at the bar are hard to pass up. Gulf Coast Oysters for a dollar each, peel and eat shrimp for $.35 each, and throw in a side of hush puppies. And you have to try the chilled stone crab claws and the colossal shrimp. The Truffle Mac & Cheese is amazing and the BLT flatbread was a surprise hit. You really can’t go wrong. If you ask the locals, they’ll tell you the Rooftop Bar at Poseidon is the only true nightclub experience Hilton Head has to offer. I have to admit, dance clubs are not my thing. But, it’s hard to argue if there’s a better dance club on the island. Planning a big night out? Go the extra mile and reserve a VIP booth overlooking the dance floor. Multiple options are available for birthdays, bachelorette parties, or just a special night out with friends. Saturdays are typically DJ nights, and Salsa Nights always draw a big crowd as Poseidon will often feature authentic salsa bands to get your feet and hips moving. 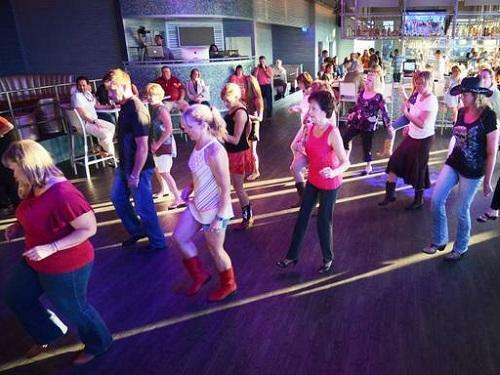 Wednesday nights are Coastal Country Nights including free line dancing lessons for the novices. 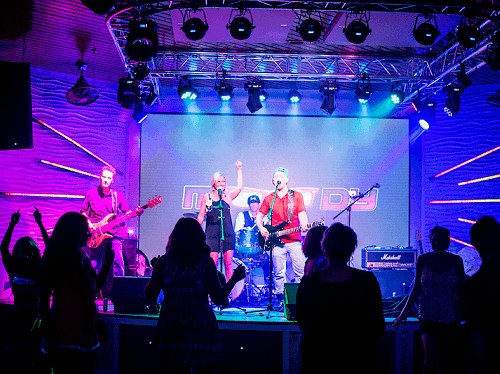 Fridays bring out the bands, from local favorites to spot on tribute bands, plus appearances from stars such as Edwin McCain. So whether you are looking to take the family out for a wonderful dinner, put on your dancing shoes, or you simply want to enjoy a beverage while watching the best sunsets on the island, you can’t go wrong with Poseidon. Check out the Rooftop Bar website for events or give the menu a once over on the Poseidon website.